As I mentioned in my post about Mississippi River Roast, I also made Mississippi Mud Pie for our Mississippi meal. (Is it just me, or were there too many Mississippis in that sentence? One Mississippi, two Mississippi, three Mississippi…) Anyhoo, about that Mississippi Mud Pie. This is a chocolate lover’s DREAM…so rich and creamy and pretty simple to make. You will have to resist the urge to make it every weekend. 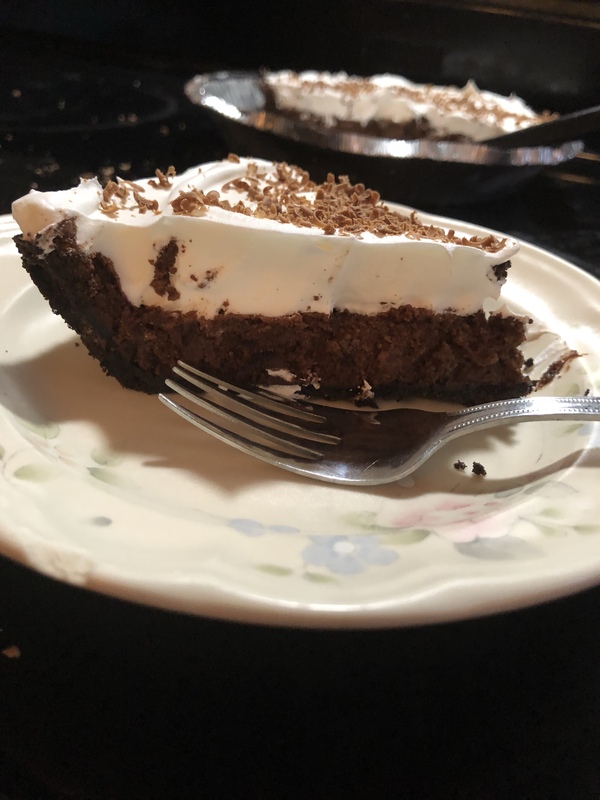 The original recipe for this Mississippi Mud pie includes making your own crust. Well, ain’t nobody got time for that in this house…I’m a working mom with two kids, a blog, an itchy dog that requires special meals, and a tendency to screw up in the kitchen. 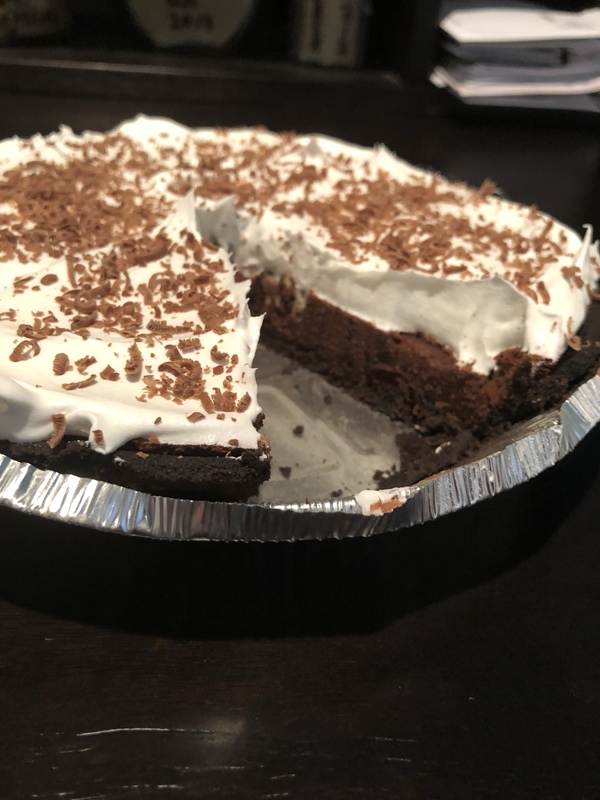 The recipe also said you can use a pre-made Oreo pie crust (grudgingly, because I have a feeling this particular Betty Crocker mom even makes homemade peanut butter). Sold! At least an hour was shaved off this recipe time. So even though I kind of cheated with the pie crust, the filling isn’t too difficult either. 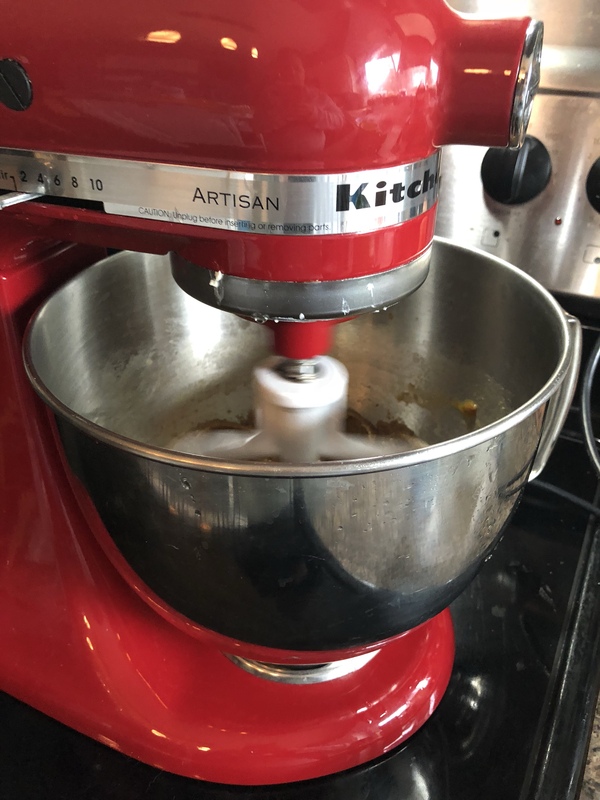 The best part is it allowed me to use my lovely Kitchen-Aid mixer. I wish I made more desserts so I could use it more often. 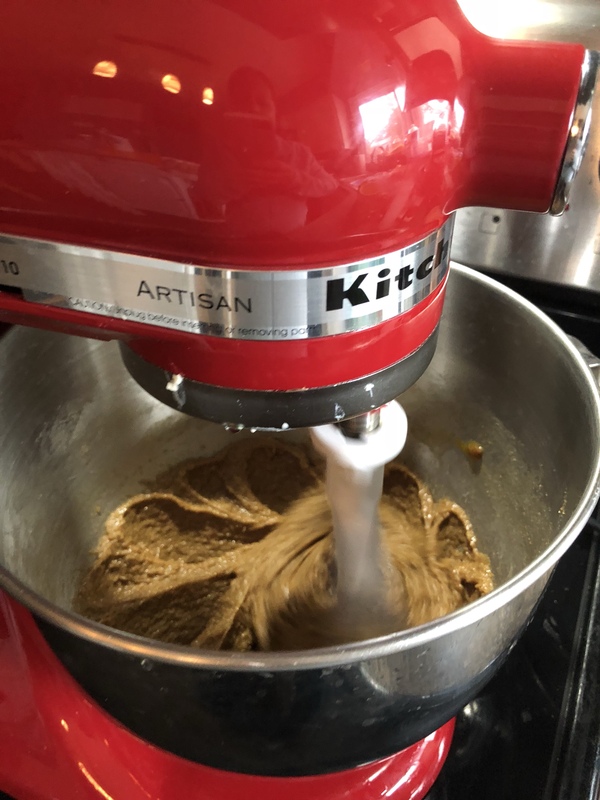 I used the Kitchen-Aid mixer to cream together the butter and brown sugar with the paddle attachment. Then I added the eggs one at a time. 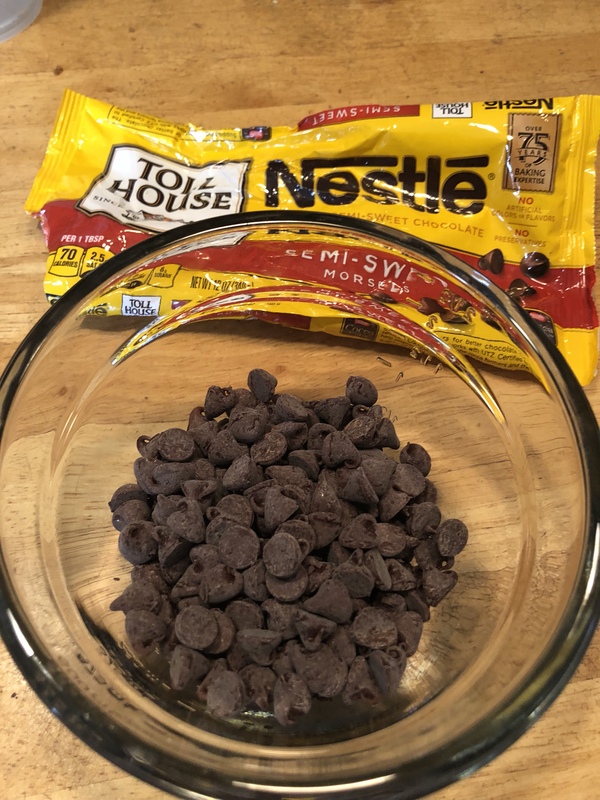 I got to use my favorite Pampered Chef product—Pampered Chef Measure All Cup—to measure out the chocolate chips. I have to confess, I kind of overfilled the cup on purpose. 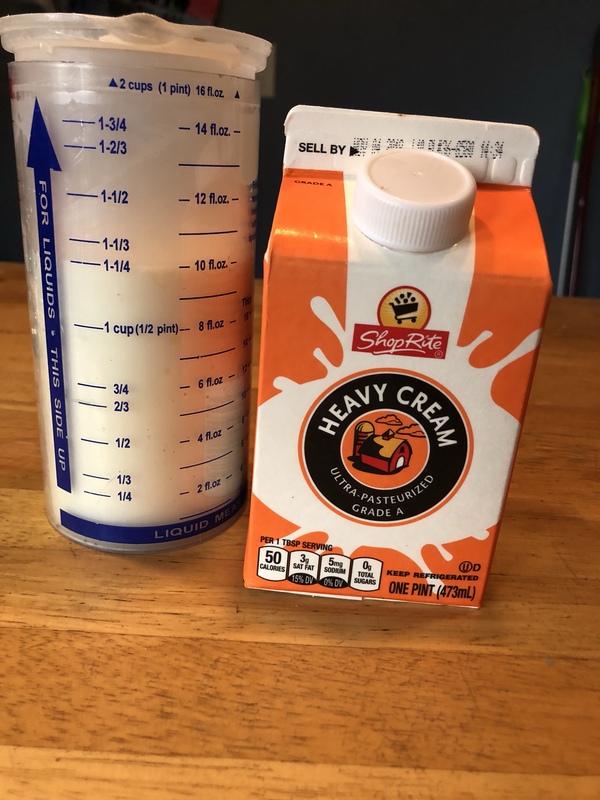 I melted those chips in the microwave in another favorite, Pampered Chef Prep Bowls and then I flipped over the Measure-All Cup to measure the heavy cream. Listen, I hate dirty dishes with a passion, and when I can use an item multiple times instead of using multiple items…well that’s a win for me. I added the melted chocolate chips, the heavy cream, and 4 TBSP of unsweetened cocoa powder into the mixing bowl. Then, I poured the mixture into the crust. Leave about a half inch from the top because the mixture WILL bubble up and you don’t want it to run over the sides of the pie. 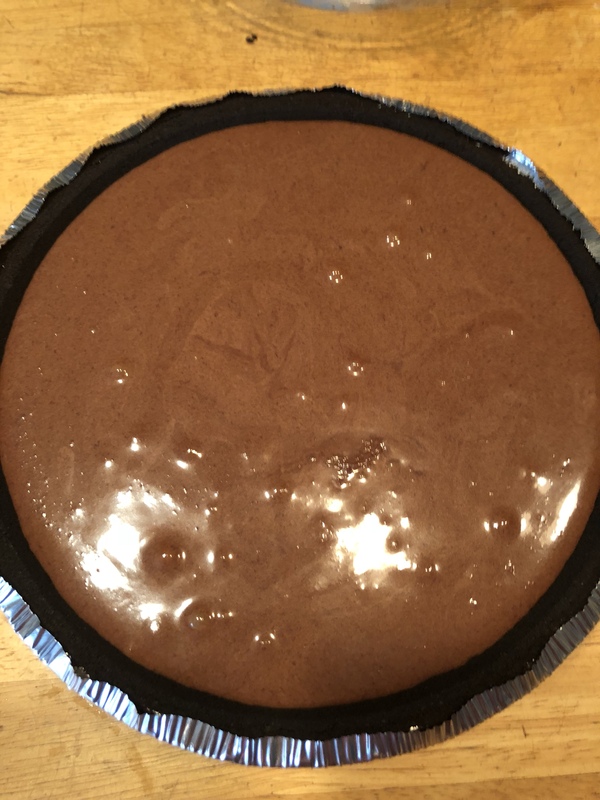 If you’ll recall, the original Mississippi Mud Pie recipe that I was following called for us to make our own crust (how silly…). The homemade crust can apparently hold twice as much pie filling, so I had enough for two pies. Now as good as this is, I don’t know if you want two pies (you’d probably have to live on the treadmill for a week). So if you only want ONE, half the recipe ingredients. Since my oven is craptastic, that’s impossible. I used the Cuisinart air fryer/ convection oven that I LOVE. I seriously think EVERYONE needs this machine. 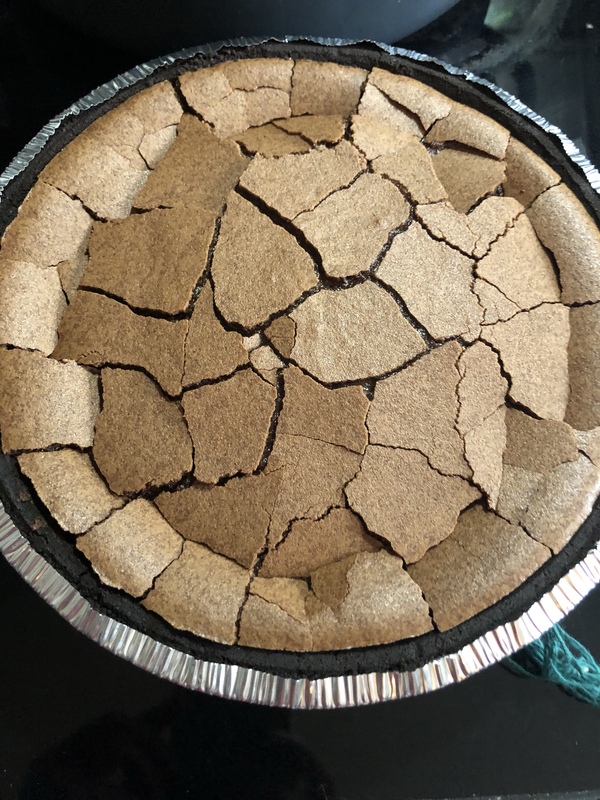 Anyhoo…the original recipe also did not specify what consistency the middle of the pie should be, causing me a ridiculous amount of stress and neurotic staring at the pie as it cooked (which I can do with the air fryer because it has a light…which my horrible oven does not). Based on the picture, I determined it needed to be a pudding-ish consistency. Ignore the cracks in the top because once you add the whipped topping no one sees the cracks anyway. And believe me, no one cares…it’s that good. 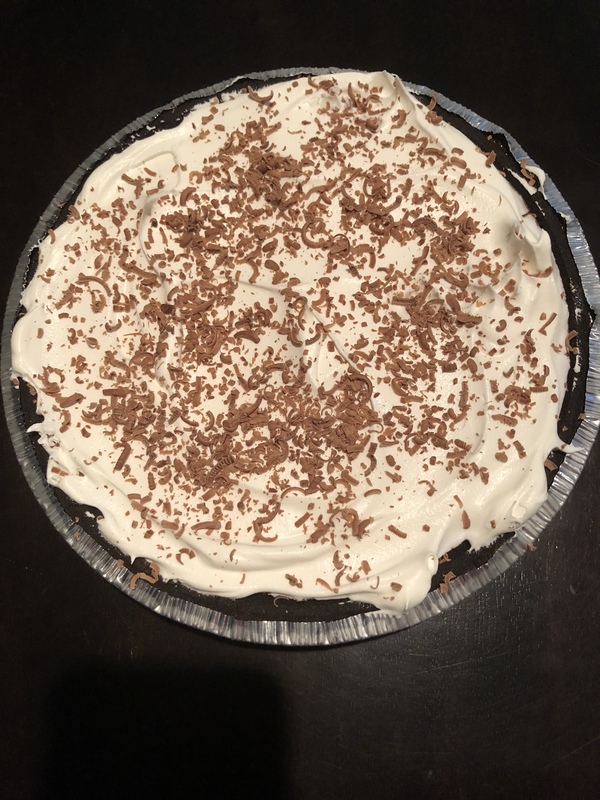 I added the whipped topping and shredded a piece of chocolate over the top. Sorry, I’m no good at chocolate curls. A word of caution…this is pretty rich…cut a SMALL slice. You won’t be able to finish much more than that (you can always come back later). And of course, pie goes really good with a glass of milk.